Champion surfer Nikki Dela Paz shares her love for the sea and her passion for riding the Philippine waves. ND: I’ve had an adventurous spirit for as long as I can remember. Ever since I was little, I’ve always been into water sports like swimming and windsurfing, and I loved the ocean. I discovered surfing in the Philippines in 2003 and I’ve been surfing ever since. Other than surfing, I love to travel, explore, and hike! It’s innate in me to seek a new adventure, to be outdoors and try something new. I love being in a peaceful, calm ocean as much as I love the waves. I love being in the mountains as well as the sea. I love being in different cultures and places other than the tropics. You’ve made quite a name for yourself in the surfing world! Which of your achievements are you most proud of? ND: I think I was just fortunate enough that I discovered surfing earlier than most. As for my achievements, I join a few surf contests like Manila Surfers’ Cup every year and I’ve won several longboard and shortboard titles. My fiancé Buji Libarnes and I started our clothing store Coast Thru Life. It began as a movement to share the beauty of classic style surfing – the old-school, California surfing scene of the 60’s – as opposed to the more commonly known surfing that has progressive, rip-tear-and-shred style. We focus on the aesthetic of timeless design and great tailoring. What are your favorite local surfing spots? ND: My favorite local surfing spots in the Philippines are Vista and Heartbreak in Ilocos Norte, and Carrille and Monalisa Point in La Union. I have yet to explore other surf spots in the South that I’m sure are amazing as well! What does it take to succeed as a surfer? ND: I think first of all you have to love surfing in order for you to get better. You can’t force it; it should be fun! The only way you can truly get better surfing is by actually surfing. Training and working out outside of the water can help, but it’s not like other sports where you can train in a gym and apply it when you surf. You get out there and you adapt to the ocean conditions that day. And more importantly, you should develop style. I think it’s a beautiful thing to watch a surfer look effortless while surfing. What tips and advice do you have for newbies? ND: For the newbies, don’t worry! We all went through slipping, falling, and wiping out but you’ll get better if you don’t rush it. Use the longboard first, develop your style, and learn the ocean. Once you’re comfortable, you can continue longboarding, which is a beautiful surfing style as well, or you can try a shorter board. Different types and sizes of boards will allow you to surf in more varied conditions. It’s also important to get a surfing instructor. They are there not just to push you into your first waves, but also to teach you surfing etiquette as well. What are some of the etiquette rules that surfers abide by when they're in the water? ND: Well, there are certain unwritten rules when it comes to surfing. When you paddle out to the line up - where most surfers are positioned to catch a wave – you should always respect the other surfers around you. Wait for your turn – don’t take wave after wave, and don’t take a wave if you see another surfer already on it especially if the surf conditions are big. Beginners shouldn’t paddle in the middle of an experienced line up; they should stay with instructors until they know what to do. An instructor can teach you these and other things such as don’t let go of your board when a wave breaks in front of you because there might be a surfer behind you. They can teach you the best places to paddle out – often called the channel – or general rules of surfing right of way. It’s better to be told these things rather than learn the hard way. What are your hopes for the future of surfing in the Philippines? ND: Firstly, I hope that the sport grows big enough for us to give the country’s top surfers the support they need to improve and compete in the international scene. I think surfing is a sport that the Filipinos can truly excel in on a global level. Secondly, I hope Filipinos acquire more awareness about surfing in general—the different styles of surfing, why one style is not better than the other, and surfing etiquette. Finally, I hope that as surfing grows, Filipinos will see the ocean as an asset. In coastal towns, houses along the beach orient their houses to the road, rather than the sea. The beach is just a place behind their homes to dump trash and sewage in. I hope that through surfing, we may be able to teach all Filipinos to take care of the ocean. How did you find out about Human Nature? ND: I found out about Human Nature when a friend gave me beauty products as a Christmas present. I was surprised to know that it was a local brand! 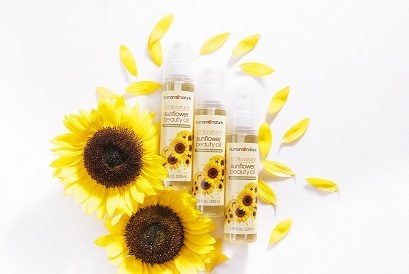 I absolutely love my Sunflower Beauty Oil and use it on my face, hands and hair. 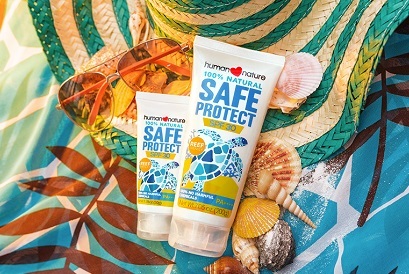 I tried the SafeProtect Sunscreen and not only does it not give me sunburn, but it smells so good! Other surfers always say, “Ang bango!” when I paddle past them in the line up!